The water was a bit deeper than I originally anticipated, but it was worth it to get to the other side of the sand dunes at Andrew Molero State Park in Big Sur. My housemates, boyfriend and I drove down the coast this morning, stopped at the Henry Miller Memorial Library, ate tacos near the river, and tromped around because tromping is the singular best activity for a birthday. The older the better. Adventure is in the air. Ryan and I have planned an ambitious road trip with stops in Phoenix, Austin, New Orleans, Atlanta, Durham, Baltimore, Philadelphia, New York City, Pittsburgh, Chicago, Denver and St. George in mind. We might very well be underestimating the size of the United States. But you know, I'm okay with that. Underestimation. Size. Time. Not knowing. I think, as I reach the cusp of my 26th year on the planet, I'm getting more and more comfortable with the idea of just letting the things I can't control dictate the things I can. So be it. We hope to blog, take pictures and draw comics of the trip as we go. And then make up all the money we spend in gas by printing the comics into handy little zines that eventually we sell for gobs of money, in which case we celebrate by driving to who knows where. 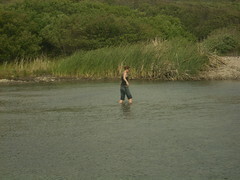 Seriously though, I hope to be fording more rivers this summer. Bigger ones, greener ones, faster ones. Stay tuned and I just might.